Amid or subsequent to a period of prolonged conflict and repression, identifying and establishing the truth about events that have since passed are core components of any transitional justice process. In Egypt, truth-seeking initiatives have taken different forms, enjoyed different mandates, and maintained different degrees of authority. The success of these initiatives has varied depending on political will, independence, ability to follow through, and many other factors. Since January 25, 2011, truth-seeking initiatives in Egypt have been largely initiated by one of four entities. The executive branch of government has formed a number of fact-finding committees since January 25, 2011, to investigate events involving significant human rights violations and matters of corruption. These committees have been created by the Supreme Council of the Armed Forces (acting in its capacity as head of state), the president, the prime minister, and cabinet ministers. The membership of the committees has included former and current government officials and legal and constitutional experts. The committees’ mandates have involved gathering evidence through interviews with eyewitnesses and victims, conversations with government officials, and site visits. The transparency and efficiency of these committees has varied greatly. The January 25 Revolution Fact-Finding Committee, for example, was commended for making its contact information publicly available, encouraging victims and eyewitnesses to share their testimonies, engaging with the media, and releasing a lengthy and comprehensive summary of its report. The Fact-Finding Committee on the Events of Maspero, on the other hand, was criticized by observers for its military-aligned membership, its failure to publicly release even a summary of its findings, and its conclusions that defended the actions of security forces despite numerous independent reports to the contrary. Concerns about fact-finding committees initiated by the executive branch abound, as many fear that the priority of such committees is on reframing facts to protect regime and security sector officials, rather than identifying the truth to bring about justice for victims of severe violations. On the other hand, an effectively and independently run executive branch fact-finding committee has the potential to enjoy immense authority to refer potential cases to trial and make a significant impact on the transitional justice trajectory. Since January 25, 2011, the legislature has formed a number of fact-finding committees pertaining to violent state acts and in some cases, even blamed state institutions for the commission of rights violations, as was the case with the findings of the fact-finding committee on the Port Said Stadium massacre. In recent years, however, the scope of these truth-seeking initiatives has changed to focus more on development and economic issues, such as the closure of a national cement factory. Similar to truth-seeking endeavors initiated by the executive branch, fact-finding committees hosted by the legislature have increasingly tended to avoid disparaging regime figures—increasingly so with the more recent politicization of the legislature. Parliament’s failure to uncover the truth represents a violation of its mandate to serve as a check on the executive branch. Additionally, its failure to follow up on investigations that it has conducted has raised questions on its ability to contribute to the nation’s transitional justice processes. The National Council for Human Rights (NCHR), a quasi-governmental institution tasked with promoting and reporting on human rights in Egypt, has established numerous fact-finding committees consisting of NCHR members and researchers to look into violations of human rights. NCHR fact-finding committees are created on a case-by-case basis and focus on single events; members of the committee will often conduct site visits; interview relevant government and security sector officials, victims, and eyewitnesses; and ultimately, produce a publicly accessible report of findings and recommendations. Since January 25, 2011, the NCHR has created dozens of fact-finding committees dedicated to investigating some of the same events as those covered by executive and legislative branch truth-seeking initiatives, such as the Maspero massacre and the Raba’a al-Adaweya Square sit-in dispersal, as well as other less-covered events, such as the Abu Qirqas violence. In its truth-seeking initiatives, the NCHR has been more willing to be critical of state institutions than the initiatives of the executive and legislative branches; however, the NCHR has a mixed record on framing around some of the more controversial portfolios, such as sectarian violence. The membership of the NCHR, its administrative closeness with the government, and the inconsistent levels of effort in its fact-finding reports are at times cause for concern about bias and only drive home the fact that the body’s investigations have not been as independent and as committed to identifying the truth as those led by civil society. Unlike the three aforementioned government or quasi-governmental entities, independent civil society groups conduct extensive truth-seeking initiatives in order to provide factual information about severe human rights violations. While the activities of civil society have been severely constrained by repressive laws and decrees on nongovernmental organizations, many organizations continue to conduct independent fact finding despite a very real possibility of reprisal. Since January 25, 2011, independent civil society has contributed significantly to truth seeking, whether initiatives led by Egyptian civil society organizations, such as the Association for Freedom of Thought and Expression’s report on the Maspero massacre, or those initiated by foreign civil society organizations, such as Human Rights Watch’s report on the Raba’a sit-in dispersal. Because of the distance between the government and independent civil society organizations, civil society is largely considered the entity most able to deliver comprehensive and fair findings and recommendations, providing a safe space for victims to share their testimonies and achieve a sense of proper closure. 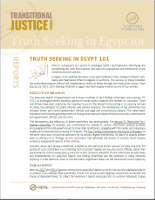 At the same time, however, and in light of limited resources, a legal scheme that impedes nongovernmental activities, and a lack of ties to state authorities, the findings of many comprehensive civil society initiatives are often left entirely ignored, unaddressed, and not followed up on by Egyptian authorities.